The truss visualisation on this page is for illustrative purposes and price calculation only. Precise drawings will be created for you after you place your order. Please note that it is your responsibility to ensure the trusses you order are suitable for your specific structural requirements. Your architect or structural engineer will be able to guide you on this. Expertly crafted, highest quality, bespoke oak trusses built to order and supplied in kit form for easy assembly on site. If you have a bespoke design and can't construct it here (we can make raised tie trusses, crook trusses, mono trusses and many other different types, see below), click here to email us your designs for a quote. Oak Timber Structures provides bespoke, expertly crafted structural and decorative exposed oak trusses. Oak trusses have been used in some of the grandest buildings throughout history and bring feelings of warmth and elegance to any home. They have a strong presence and give a traditional, natural look to your roof space. Oak trusses can complement the style of any building, from a rugged, chunky, "cottagey" look, to grand, modern properties wanting to incorporate traditional, high-quality timber. Oak Timber Structures offers a bespoke service supplying high quality, solid oak trusses to standard or bespoke designs. Why Use Oak For Trusses? Oak combines strength and beauty and has been used by craftsmen in high-end products and buildings for thousands of years. Oak is extremely durable and our trusses will easily last hundreds of years without any maintenance required. Oak has a rich, warm, golden colourand an attractive, natural, recognisable grain texture. It can be stained to a particular colour or to bring out the grain even further or can be left bare in its natural state. Each oak truss is uniquely and expertly crafted just for you with exceptional attention to detail. Our experienced craftsmen pour their lifelong experience into each truss using traditional, tried and tested joinery techniques, with dowelled mortise and tenon joints. Each section of oak used in our trusses is planed on each side for a luxuriously smooth finish. We use a high grade of fresh-sawn oak sourced from European forests (it is graded between QPA and QP1 standards, the best available). Such a high grade ensures large, clean beams with no large "dead knots", or anything considered to be defects found in lower grades. Our craftsmen love working with this quality of oak. Oak Timber Structures is proud to be up-front and transparent with its pricing. Use our truss designer above to get an instant, fixed price for your trusses. The only additional cost is delivery which is added during the checkout process and depends on your location in the country. We started Oak Timber Structures because we spotted a gap in the market for high quality yet affordable oak trusses. Only a couple of our competitors give indications of their prices up-front. Our pricing is the same regardless of who you are or the size of your project. 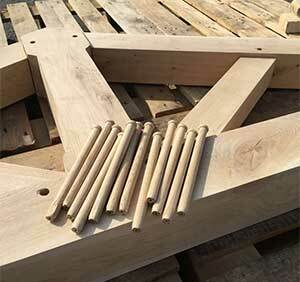 Our oak trusses are the same or better quality than many of our competitors for a lower price. There is no catch, we're simply bringing honest, straight forward pricing to the market. Ordering from us is straight forward and we're available at every step if you need any assistance. Create your truss using our unique truss designer above or send us your own drawings. We produce comprehensive technical drawings for you to sign off and get approved by your structural engineer. Your unique, expertly-crafted trusses are constructed. They are fully assembled, all components are numbered and then dismantled for delivery. The trusses are delivered to you as a straight-forward kit, for simple assembly and installation by you or your builder. Delivery is scheduled with you once your trusses are ready. The tie beam is the large oak beam at the bottom of the truss. This rests on top of your walls, spanning the gap between them and supports the rest of the truss above it. On our designer you can specify the span, or distance it has to cover, its width and its height. The king post is the vertical beam in the centre of the truss. The king post adds to the strength of the truss. The standard King Post is a straight vertical beam, whereas the Shaped King Post is slightly wider at the top and bottom and tapered where the braces (see below) join it. 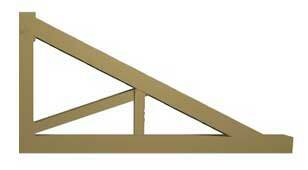 Queen posts are often used on wider trusses and replace the single King Post with two vertical posts. The rafters are the angled beams that the shape of your roof will follow. Rafters extend from the ends of your tie beam to the peak of the truss and are essential to the integrity of the truss. Braces add support to the truss between the rafters and the king post or the rafters and the tie beam. Sometimes they are not structurally required but are included for aesthetic purposes. On our designer you can choose how they are positioned and whether they are curved according to how you'd like your truss to look. For further information on the mechanis of trusses visit Wikipedia's Truss Page. 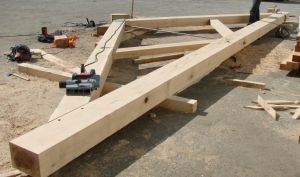 A kingpost oak truss features a central, vertical post. Our King post European Oak trusses are that grand 'wow' feature of any building. The natural beauty and skilled craftsmanship in our king post oak trusses will prove a major role in creating your dream look you want. It will only be done once so it's important to do it right first time round, knowledge and craftsmanship are vital. You can design your king post trusses on our 3D builder above. The queen post oak truss excludes the central post found in the king post. Our queen post oak trusses are another traditional design but can come in many different layouts according to the structural engineer's requirements and also the client's. The queen oak post truss design have been used for centuries and often used when wider spans are required or to even add an additional roof room. 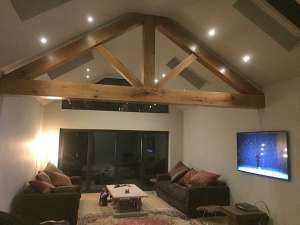 Many people today choose a queen post oak truss when requiring another living area upstairs, the positioning off the braces allow you to create a sound structural oak truss as well as having the space in between braces to allow a walk through space in to another living area. You can design your queen post trusses on our 3D builder above. The best way of describing a raised tie truss is to think of the capital letter 'A'. Raised tie (beam) trusses are essentially a king post truss but with the bottom oak beam higher up, allowing more ceiling space. They are therefore normally used where there's limited head space, or if the overall building height is restricted. Mono trusses are basically half oak trusses are usually used in lean to buildings and smaller side buildings and extensions. With the truss only having one principal rafter and one tie beam the design has to be slightly different by adding in extra braces or support to support the principal rafter. Instead of straight primary rafters, the rafters of a cruck truss curve together and meet at the top, giving an elegant, sculpture-like look. Large cruck trusses produce a traditional "grand church roof" style. Cruck trusses are making something of a comeback in house renovation and new builds for people who want solid oak trusses but aren't a fan of the straight edges found in the more popular king and queen oak trusses. 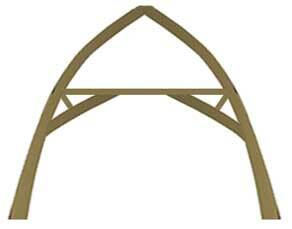 Instead of a straight tie beam, the arched truss sees the bottom tie beam curved, raising in the centre. Arched trusses are very popular in properties with a more rustic, country feel. Oak Timber Structures can quote for any type of oak truss you might need, including trusses with steel fabrication and non-symmetrical trusses. Get in touch for a quote. Why Buy Your Trusses From Oak Timber Structures Ltd? All of our staff have previously worked in the timber industry before working at Oak Timber Structures. Our customer service is second to none. We believe in two things. The highest quality timber products and the highest level of customer support. We are here for you every step of the way. We can't convey enough how proud we are of the quality of our trusses. From raw materials, to attention to detail in craftsmanship, to delivery of the finished item. You will love your Oak Timber Structures Trusses. We have created the world's first oak truss designer (above) allowing you to price and order a huge variety of trusses. The instant, exact and transparent pricing is a first in our industry. Your trusses will be delivered on a lorry ready to assemble. Each piece is coded making assembly simple for you or your builder. Because each truss is individually made we currently have a 6 - 8 week (from drawing sign off) lead time. Because many of our customers already have lifting equipment on-site, our lorries do not have unloading equipment on them. You will therefore need unloading equipment available, such as a forklift or crane, or enough manpower to manually unload the components. Oak is very heavy so please ensure you have means to safely unload from the lorry. We are proud to feature the WORLD'S very first 3D Oak Truss Designer on our website. Designed to make your truss-ordering life as easy as possible, you can specify almost every aspect of your truss and see it change in front of your eyes, with the price updated instantly. The truss designer is at the top of this page. Have a go and let us know what you think. Go to the truss designer. If the exact truss you want is available above, you can place your order securely on this website, or call us to place your order. If you'd like something bespoke, give us a call (01889 597283) or send an email with your requirements and we can give you a fixed quote. When you are ready to proceed, place your order online or over the 'phone with us on 01889 597283. We create a computer design to your exact requirements. This takes 2 or 3 working days. We can change the design at this stage if required until you're happy. Many people consult their builder at this point to double check everything. You approve the drawings and we put your structure into production. It is from this point that our quoted lead time begins. During this time, many people use the approved drawings to get all of their groundworks in place. 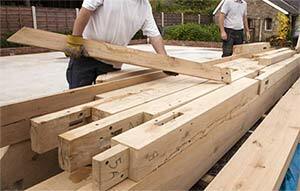 When your oak structure is completed, we arrange delivery on a suitable day for you. Please note: We can provide the designs to your structure on their own to be used in planning applications. We charge £100 ex VAT for this, which will be taken off your final order amount.